Cherish Each Precious Day: Happy Friday - Itty Bitty Blog Candy! Patti ~ all of these cards are gorgeous! 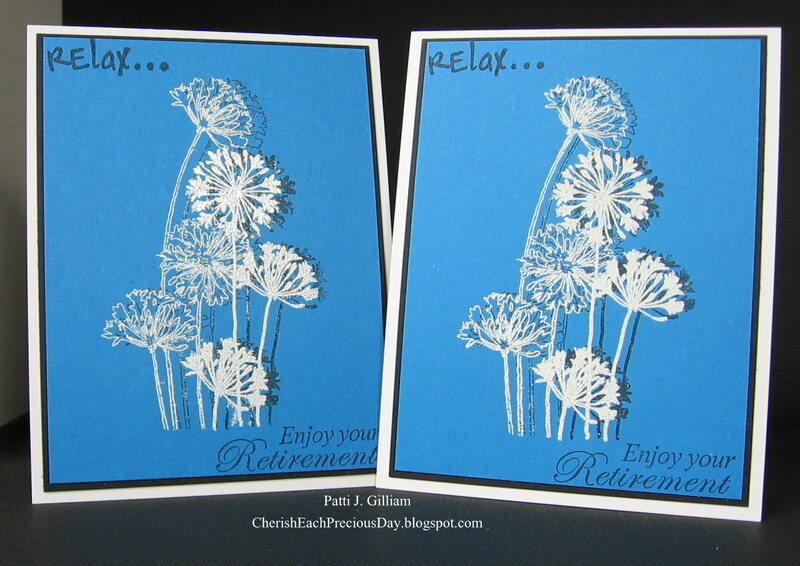 I love the flowers on your two retirement cards and since the ladies are gardeners they will love them too! Now that card you made for your new grandson is stunning and elegant! What a beautiful keepsake for your grandson!! Have a safe trip and a very Happy Birthday! Beautiful card! Have a wonderful birthday. Already following you. Your cards are gorgeous! Those flowers on the top cards are so elegant! 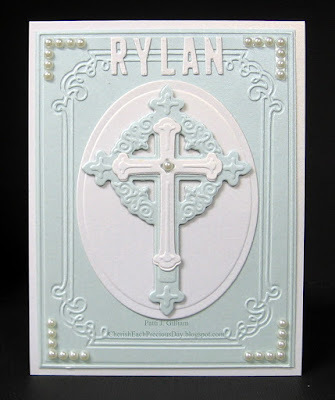 And those crosses on the baptism cards are stunning! Thanks for sharing! 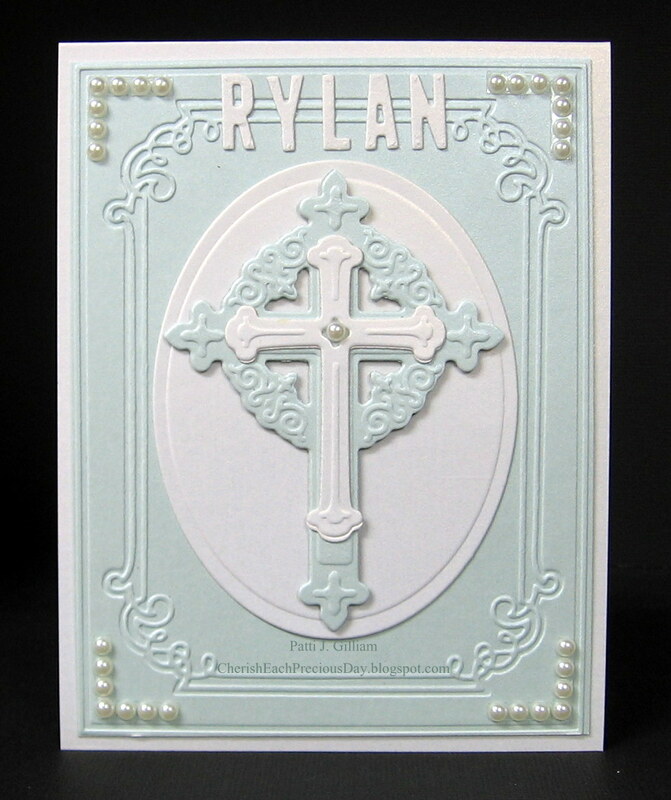 Awww...love how you added the pretty white pearls in the corner of Baby Gilliam card, turned out beautiful and I know you put your heart in this one. We grandmothers sort of tend to do that often. I know it will have a place in his babybook for him to look at when he is a man. I saw the other two cards and IRL they are even more stunning. 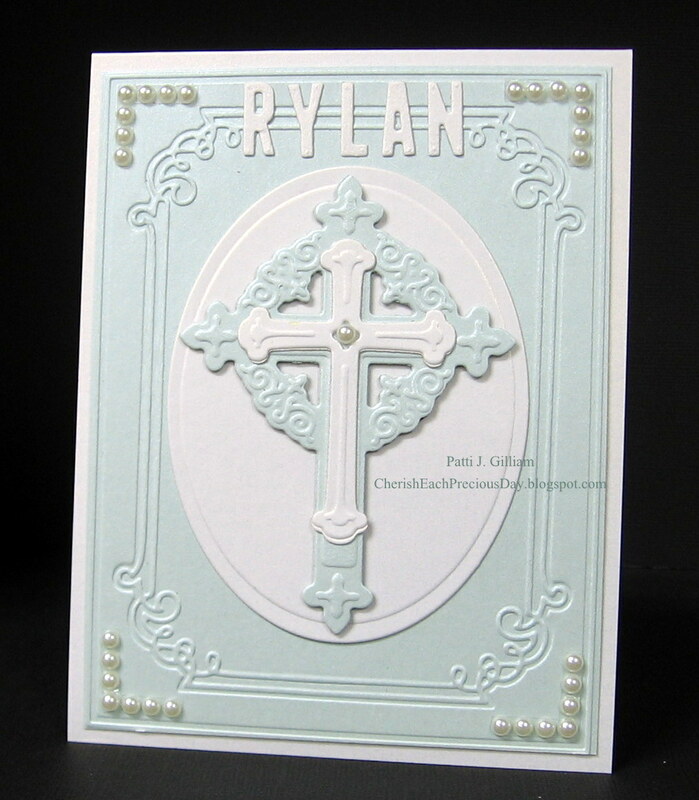 Beautiful Baptism card. Happy early birthday and safe trip. I just love ALL your cards today, Patti. I've got to try that shadow stamping technique. You've got it down, and it looks awesome. 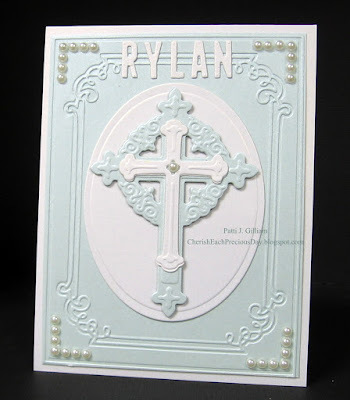 Your baptism card is just stunning. It will surely have a place in the baby book to be saved forever and ever. These are gorgeous! Happy early birthday!!!!!!!!!!!!!!!! I hope you have an amazing one!!!!!!!!!!!!!!!!!!! Very pretty! 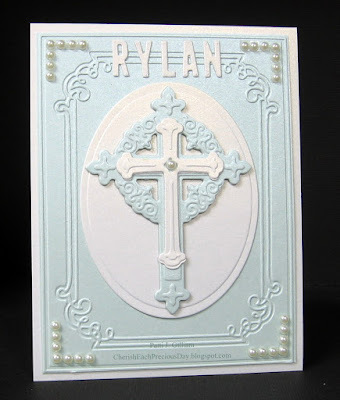 The baptism card is stunning! 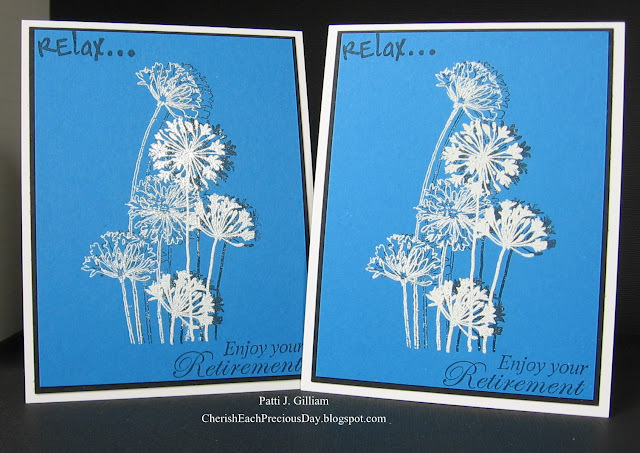 The shadow behind the blooms is perfect and I do like the white embossing. Very pretty. 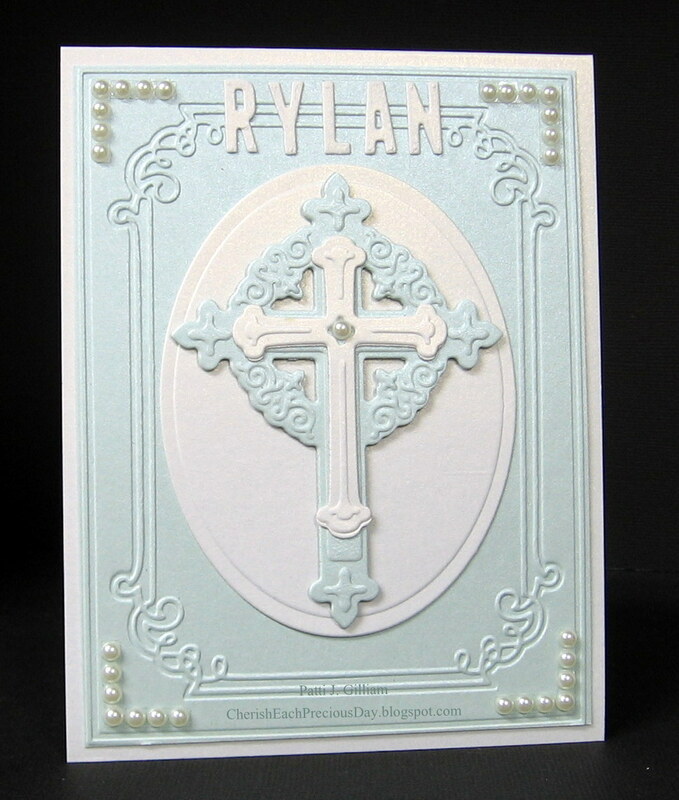 Layering the cross is awesome, again a wonderful dedication card. Beautiful cards, Patti. You are ONE busy lady. LOL. It's okay to CAS a card, especially one as beautiful as the one Shirley did, too. I just bought a Darice die with crosses and needed an idea. Thanks for sharing. Happy Baby Snuggles Patti, what a lovely way to spend your Birthday! Have a fab time, and a safe journey! Happy birthday Patti, what a fun way to spend it! Gorgeous cards, I almost CASEd Shirleys card too but it is a bit of a drive for me. Enjoy your day! and Gorgeous card agree with Donna..